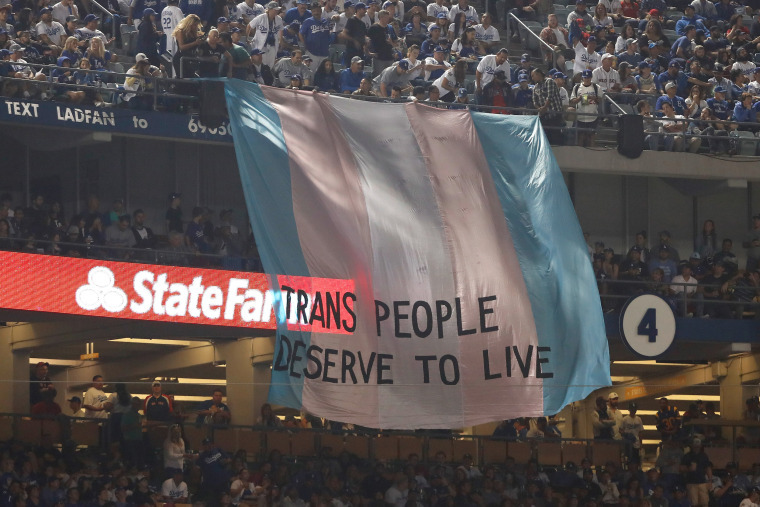 A group of activists sitting in the upper deck of Dodger Stadium unfurled a massive pro-transgender banner during the fifth inning of Sunday’s final World Series Game between the Boston Red Sox and Los Angeles Dodgers. “Trans people deserve to live,” was emblazoned in black letters across the massive pink, blue and white trans pride flag that was draped from the stands. The TransLatin@ Coalition, a nationwide organization that advocates for the transgender Latina community in the U.S., was behind the banner, and the group posted a video of their Dodger Stadium demonstration on their Facebook page. The organization’s Facebook video shows Salcedo and another protester being escorted out of the stadium by security. According to the Blade, one person was detained but not arrested. Sunday’s protest comes just one week after The New York Times reported on a leaked draft memo from the Trump administration that included a proposal to redefine “gender” as an unchangeable condition determined solely by a person’s biology. The U.S. Department of Health and Human Services argued in the memo, which has not been seen by NBC News, that the government needs to adopt a uniformed definition of gender “on a biological basis that is clear, grounded in science, objective and administrable,” the Times reported. Since news of the memo surfaced, several LGBTQ organizations, including TransLatin@ Coalition, have mobilized on a national level, staging protests and rallies in opposition to the current administration.